Busch Gardens Tampa is known for its amazing thrill rides, including the Falcon’s Fury drop tower that delivers a one-of-a-kind ride experience. 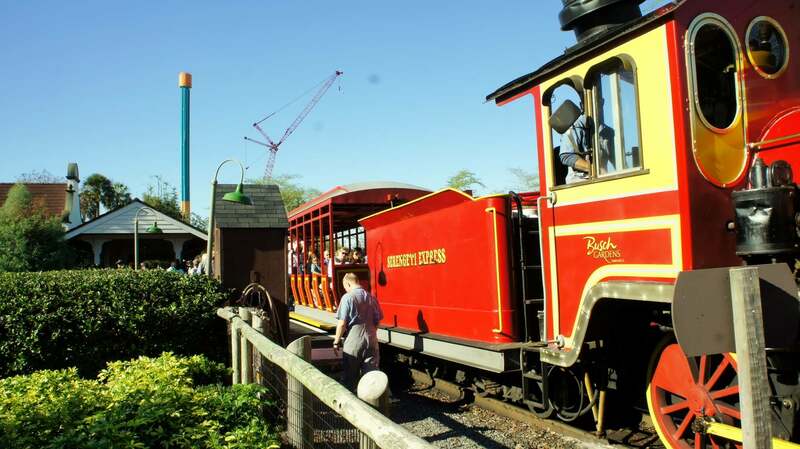 But the park is more than thrills and rides – when it first started, the only attraction (other than a brewery) was the Bird Gardens, and even now, with the growth in the park’s size and the thrills a major part of the experience, its animals are still an important part of any visit. Important and fun – and while most of the exhibits keep you separated far from the animals for everyone’s safety, there are several spots where you can get up close and personal with them. These are undoubtedly the most fun, and I’m going to tell you which are also the best. The Elephant Interaction Wall is an area that gets you as close to elephants as you can while still maintaining your safety. Here, the elephants will come right up to the gate to interact with their trainer and receive treats in exchange for demonstrating behaviors for the crowds. Each time you stop here, you could see a different member of the elephant herd, as they come to the gate of their own free will and are never specifically selected to participate. The Serengeti Express Railway is not only an excellent way to rest your feet after walking the park for a while, but the section of the train ride between the Nairobi and Congo stations takes you right through the Serengeti Plain. This is an area of the park where the animals roam freely, and you can see herds of animals strolling close to the train. Sometimes they’re so close, they even have to stop the train to wait for the wildlife to cross the tracks! While you shouldn’t reach out to touch any of the animals (they repeatedly warn you to stay seated with arms and legs inside the train), you sometimes come close enough to the animals that it’s quite the temptation. Unfortunately, due to construction for an upcoming attraction, the Serengeti Express is closed for the remainder of 2015. The Tiger Pop-Up, in the Jungala area of the park, is an amazing spot where you can safely get very close to tigers. They’ve designed this exhibit to have a small area, enclosed in very strong plexiglass, where, after climbing a short ladder, you’re actually inside the exhibit with the tigers themselves. The tigers seem to be oblivious of this intrusion into their space (most of the time) and will walk right next to the pop-up. Quite often, I’ve even seen them lay down to sleep on top of the plexiglass box, allowing you to get closer than you’ve ever been to a tiger! 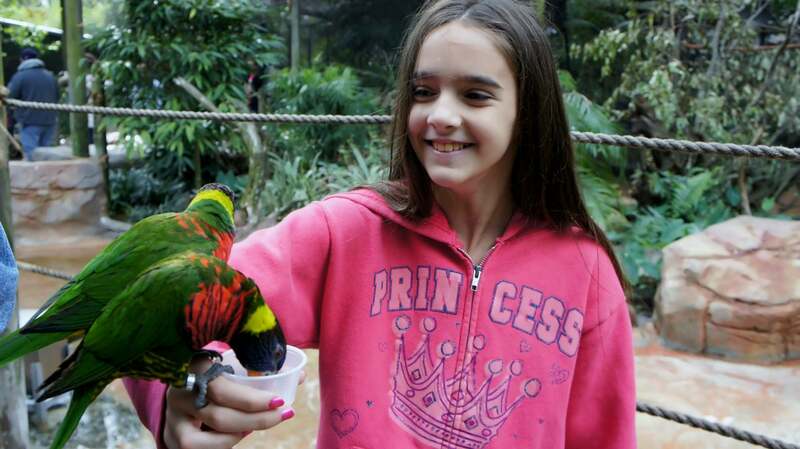 Walkabout Way is one of a handful of exhibits where you can feed the animals. 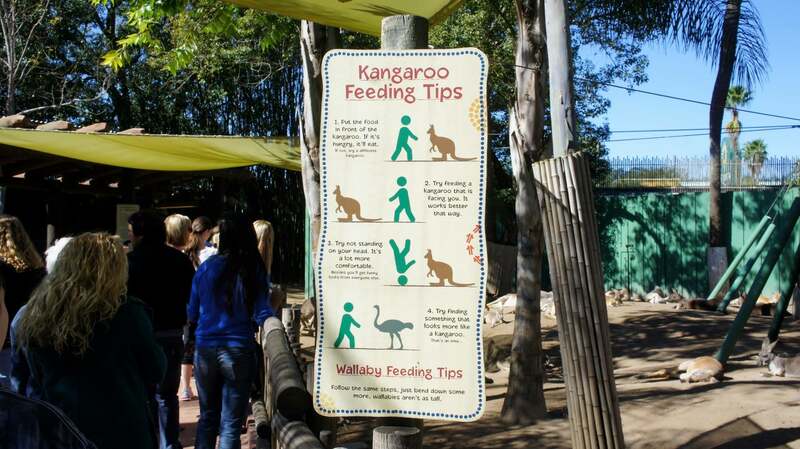 Here, guests can purchase cups of grass (or, at certain times, bottles for the younger ones) and feed kanagroos and wallabies. They even have helpful signs offering advice on how to feed them. While you’re still separated from the animals by a fence at this exhibit, most of the animals found here have been hand-raised by humans and have no problem being touched as you reach through the fence. While at times these are some of the laziest animals I’ve seen in the park – and they tend to sleep far out of reach from your hands – the moment the food comes out, they’re very attentive and anxious for your attention. 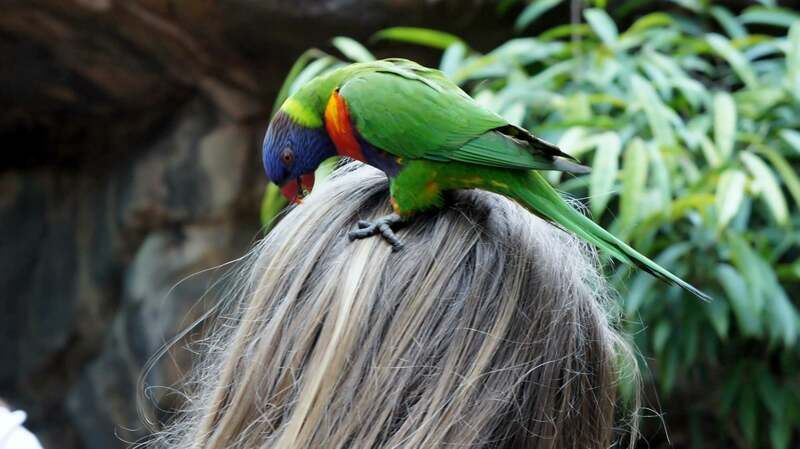 Lory Landing takes my top spot for animal interactions, hands down. This is a bird exhibit where you enter into the enclosure, and there is nothing between you and these colorful little birds. If you stop to purchase a cup of nectar, these birds will have no fear of you whatsoever (and, sometimes, you can even trick them into trusting you with an empty cup of nectar someone has left lying inside the exhibit). My family has personally had several birds at one time land on them and even fight amongst themselves to be the one drinking from the nectar cup! They’ll land on outstretched arms, fingers, shoulders, and even the top of your head. My advice is to visit this enclosure as early as possible, as the birds will fill up on the nectar throughout the day and become less friendly as the day wears on. All of the experiences I’ve mentioned are really amazing, but the most engaging animal interaction experience in the park doesn’t come included with the admission fee. The Serengeti Safari Tour is a separately-priced experience that takes you out into the Serengeti Plain while standing in the back of an open-air truck. 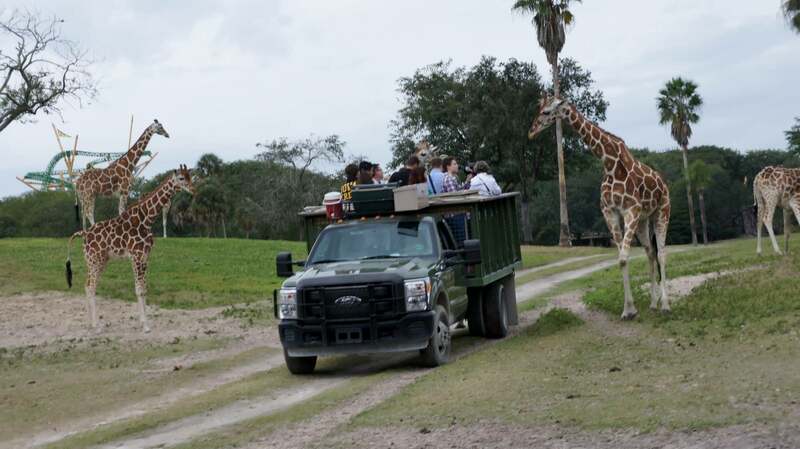 Your guide will take you right out into the animals, and you’ll be given food to feed the giraffes. I’ve seen the giraffes stick their heads all the way into the truck to receive the food, giving everyone ample time to have the once-in-a-lifetime experience to actually pet a giraffe. While they don’t guarantee you’ll experience the giraffes up close every time (they occasionally choose to ignore a truck), I’ve yet to see a truck out on the plain not be surrounded by the animals looking for a handout. While the price varies based on the season (and, yes, Annual Passholders receive a discount), these tours always sell out very quickly. Busch Gardens recommends purchasing tickets early in the day so no one gets left out. So the next time you’re at the park, racing along at 60 mph on Cheetah Hunt or hanging 200 feet in the air on SheiKra, remember to stop by one of these exhibits and experience some of Busch Gardens’ amazing animals. 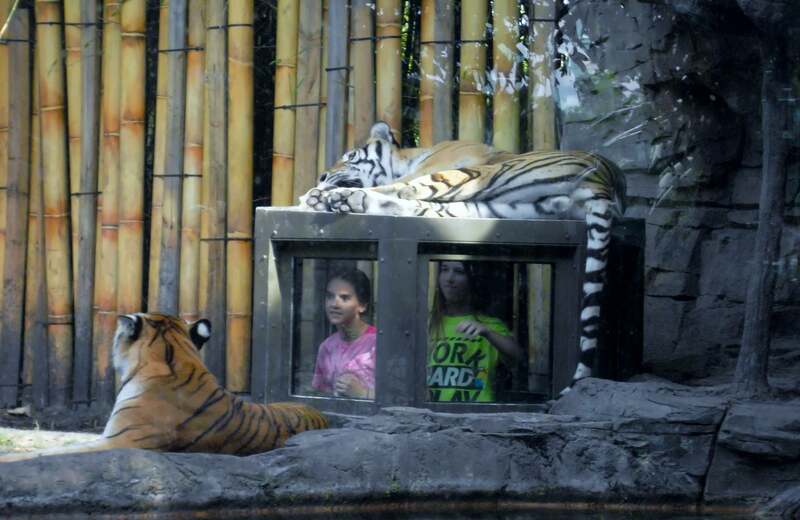 Have your own favorite spots to interact with the animals at? Leave a comment below! 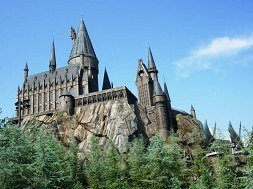 Salina is a Florida native that has gone to theme parks all of her life. Even with the busy schedule that comes with having children, Salina and her family make it a priority to visit the parks several times a month. Quality family time should always include a roller coaster or two!